We had a great talk at DTM today from Dr. Mark Wieczorek, a geophysicist from the Institut de Physique du Globe de Paris. Total magnetic field strength at the surface of the Moon as derived from the Lunar Prospector electron reflectometer experiment. 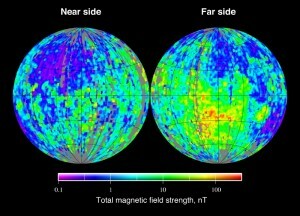 From http://en.wikipedia.org/wiki/File:Moon_ER_magnetic_field.jpg. He talked about the geophysical history of the Moon as inferred from remnant magnetic fields in lunar rocks. Currently, the Moon does not have a large-scale magnetic field, as the Earth does, but there are smaller-scale magnetic anomalies (see figure at right). These remnant magnetic signatures probably indicate that long ago (about 3-4 billion years ag0) that Moon DID have a magnetic field. So why did the Moon have a magnetic field long ago and why doesn’t it anymore? One exotic idea Dr. Wieczorek talked about was the idea that large asteroidal or cometary impacts could disrupt the rotation of the Moon’s mantle. As a result, the mantle and core would rotate at different rates in different directions, which could stir up and heat fluid in the Moon’s interior. This heating could drive internal convection and produce a magnetic field, similar to the way the magnetic field in the Earth is generated.